Stamp a scene then colour it in! Fairies, flowers and garden critters can be combined in countless pretty ways! 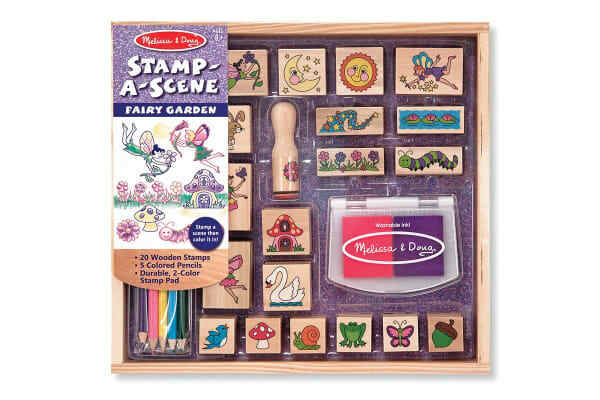 The Melissa & Doug Fairy Garden Stamp Set makes it easy to create an exciting storyline or a colour-in scene. 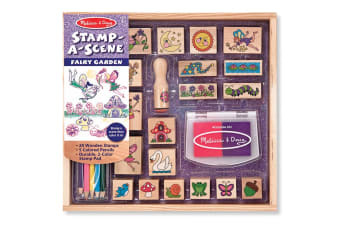 The Melissa & Doug Fairy Garden Stamp Set includes 20 rubber-faced, wooden-handled outline stamps and a two-colour stamp pad filled with pink and purple washable ink. Five coloured pencils co-ordinate with the garden theme to add details and colour in the scene. It’s a complete arts and crafts activity and storytelling kit in one!